Developed alongside the Cinch Tight compression bandage, the H&H Thin Cinch provides the same emergency trauma capabilities in a smaller, more versatile package. Manufactured with a 4”x7.5” ABD pad, it’s vacuum sealed and flat folded to be small enough to fit in a standard size pocket. With H&H"s 5 foot proprietary elastic strap. the Thin Cinch is strong enough to provide compression to wounds on any location. Perfect for use on children and elderly with thin limbs, the Thin Cinch provides a fast, effective tool for many kinds of traumas and injuries (particularly those involving arterial bleeding in extremities). 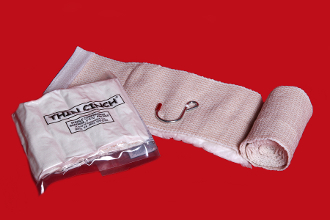 The H&H Thin Cinch comes in a sterile, vacuum-sealed 4 mil barrier bag, flat folded to create a small tight package.